During the First World War around 350 of the male workers left Waterfoot to fight for their country; 44 died in the conflict and the workers who had survived wanted the sacrifice of their colleagues to be remembered. They achieved their aim in a quite unique way. In 1921 with contributions from the workforce and the management, and with money raised by the factory Choral Society concerts, Thistlemount House and its grounds were purchased. The grounds were opposite the Gaghills factory. 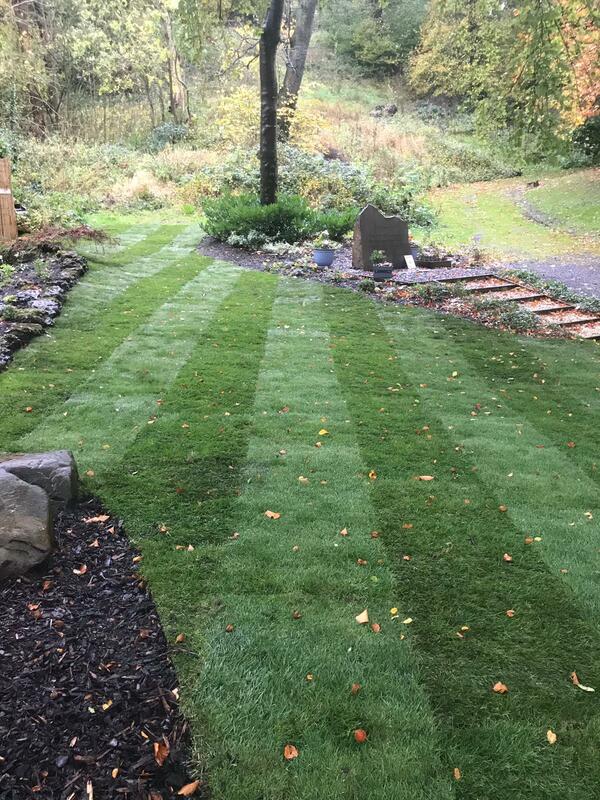 The house and the grounds were then immediately gifted to Rawtenstall Corporation, together with £500, and a plot of land donated by Mr J H Hirst (another local businessman) to provide a pleasant open space and gardens for the people of Waterfoot to enjoy. 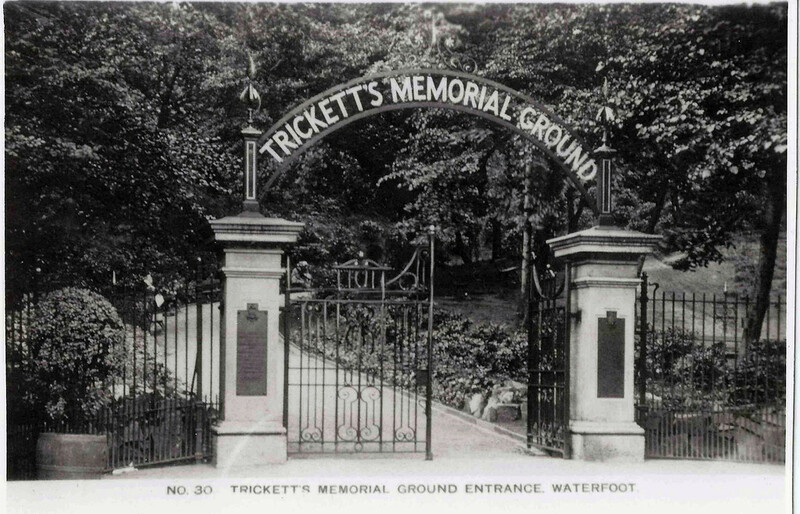 It’s taken 2 years and four hardworking Civic Pride (Rossendale) volunteers but Trickett’s Memorial Ground is finally ready for Remembrance Day on November 11th 2018. Brambles cleared, areas newly planted and a huge hanging planter in the centre of the main lawn started to attract the attention of passers-by in the first few months. New benches and litter bins, old benches repainted, repainting of the railings and bus shelter were complemented with a sensory lavender border by the main path. To get it ready for the Remembrance ceremony a new lawn has been laid to the left of the main gate leading to the memorial. ‘The satisfaction of seeing so much achieved by such a small team is extremely gratifying’ quoted Charlotte Hocking, Finance Officer and TMG volunteer. No longer an overgrown, neglected small park it’s been transformed into a place of peace and tranquillity used by locals and visitors alike. Financed largely by the Postcode Lottery Fund, several other organisations have also made grants and staff from Waterfoot Co-op were given time to help. This is evidence of what a community can achieve when people just roll up their sleeves and get on with it. Well done to you all. 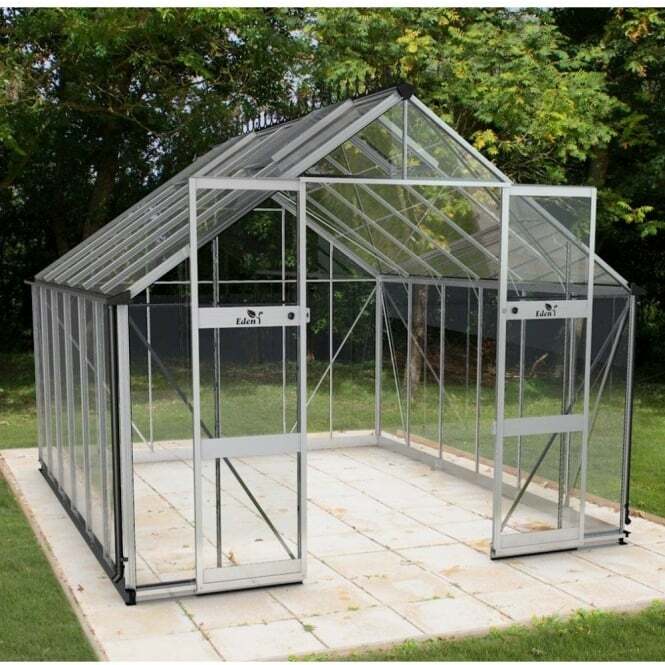 With the generosity of our supporters and a substantial grant from Skelton Bounty we now have sufficient money to make a start on our greenhouse project. We’ve started to clear the site and planning permission has been granted so the next job is to lay the concrete base ready for the greenhouse itself. an interesting evening was assured! A full analysis of the finding has yet to be undertaken but it was amazing to witness the enthusiasm and quality of the ideas generated. More on this in the next newsletter. No names will be mentioned in this article but a volunteer who has only recently moved to the area commented it was the clean streets and beautiful gardens that helped her in deciding that the valley was the place she wanted to live to be near her family. This lead to a meeting in the Siphon coffee bar to find out a little more and see if we could build a useful article around it. It appears that when the lady in question visited the estate agents she was warned that house prices were rising because people are moving up from the South. London? The South East? No…Manchester! Having lived in the valley for over 40 years it was amazing for me to listen to the impressions of somebody who’d never seen the Valley Centre, litter strewn streets and the derelict gardens. Now that we have clean, colourful gardens with lots going on, it made me realise how much has changed, particularly in the last few years. This was reinforced a few days later when I was interviewed by a young lady who has been tasked with compiling a report on where she lives for her university course. When asked how I thought the area had changed, she was genuinely shocked by explanation of the difference Civic Pride volunteers have made. Born at the end of the last millenium she has grown up assuming that the area had always been like this! A new name for the group to better reflect their activities as they ensure that yet another part of the valley gets the TLC it deserves. Since the last newsletter they’ve also achieved a Civic Pride first! One of the volunteers, Arlene, was attempting to dig a hole for some recently donated plants at Regent Street gardens when she hit a large piece of buried slate. 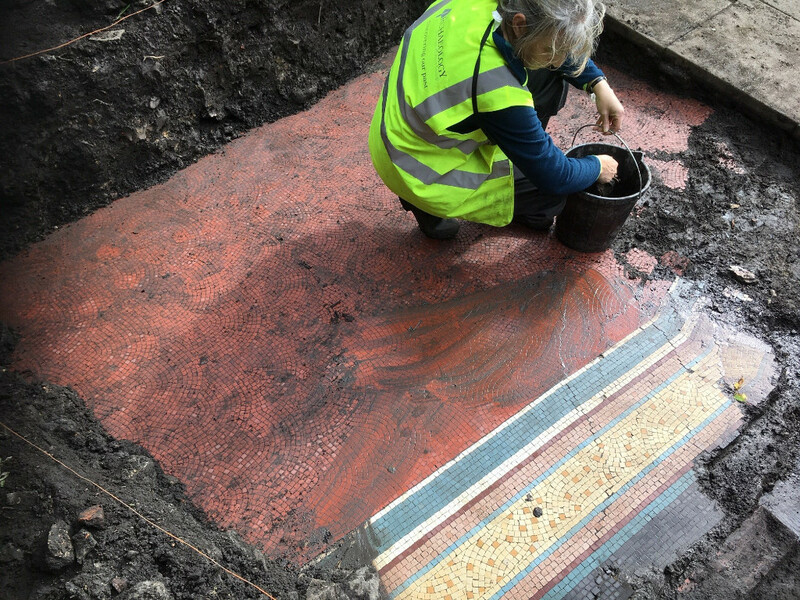 The following Monday Jean, Kathy and Renate tried to dig up the slate but instead, started to reveal a colourful mosaic! A bit of research identified that they were digging on the site of the original Lancashire and Yorkshire Bank! Pendle Archaeology & Local History Group kindly volunteered to assist with a one day dig and more of the remains of a rather attractive public area floor were revealed! It’s now been backfilled awaiting a grant being organised by Proffitts and RBC after which it is hoped to make an unusual feature. 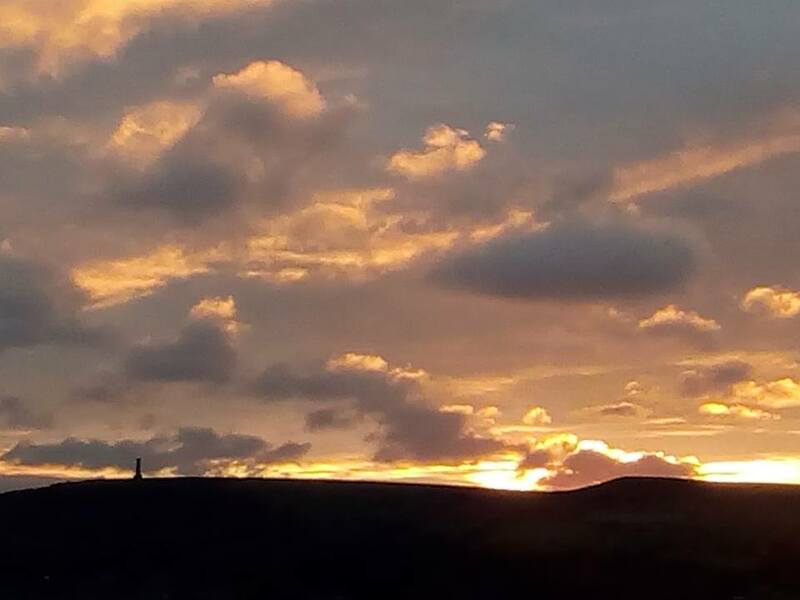 Thanks to Civic Pride Rossendale for inviting us to their recent Ketso session, I went along to represent both Bacup Pride and Stacksteads Countryside Park Group, two independent groups who have similar objectives to CPR but who each tackle these in their own ways. The discussions gave me much food for thought which I will share with both groups, thank you for making this gate-crasher feel so welcome! 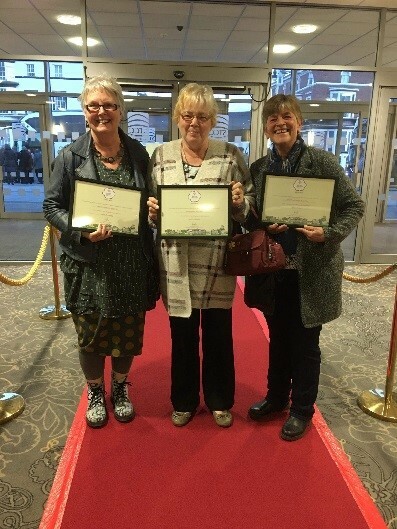 The week got even better by Thursday when we attended the RHS Its Your Neighbourhood/In Bloom Awards in Southport. Despite all the challenges that this summer threw our way; road works for replacement gas main at the side of a proposed planting area, planters being fenced off as part of the THI work and of course a blistering hot summer, we were delighted to receive three awards, level 2 Improving for Barclays Bank Garden, level 4 Thriving for the Irwell Terrace Planters and a fabulous Level 5 Outstanding for the Wall of History Garden. Thanks to all who contributed in whatever way possible to ensure we achieved these awards. On Sunday November 18, Weir Pride will be hosting the first Christmas Craft Fair at the Doals Centre. From 2pm to 4pm there will be a host of stalls by local manufacturers selling everything from wooden items, and knitted gifts, to soaps, candles and paintings. Weir Pride will also be running a number of stalls to raise money for the village. These will include a chocolate tombola, raffle, cafe and the sale of knitted and craft items made by the Knit and Natter Group. The cost of hiring the hall has been funded by a Living Well Living Better grant. It was a hectic time for Weir in July when hundreds came along to the second Weir Village Fete. The host of new attractions, including the noisy opening ceremony by Rossendale Drum Majorettes, a pet show and children’s crafts and races ensured the park was busy all afternoon. The fete raised more than £1,400 for Kidney Research and Weir Pride. 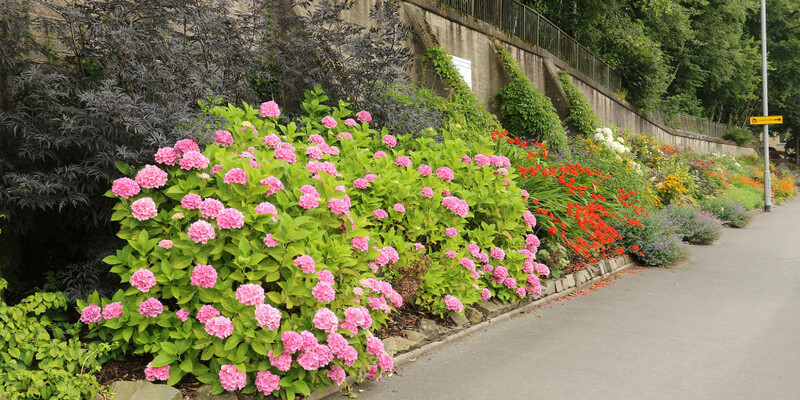 Weir’s beautiful planting was also judged by the Royal Horticultural Society where they won several awards including a ‘Thriving’ award for Heald Lane Bloomimg Borders. 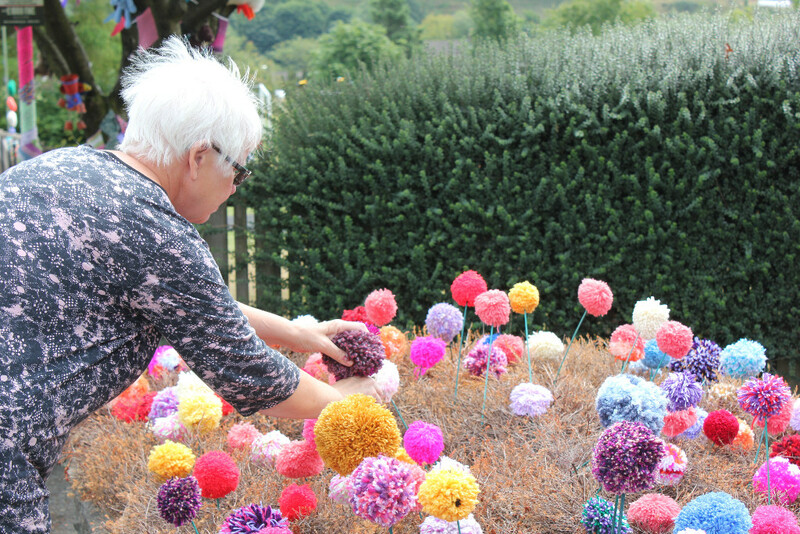 It’s a pity they don’t offer prizes for woolly pom-poms judging by the picture! Our wonderful display of bedding plants in tubs around the village are coming to an end, but I hope to replace with hardy, seasonal displays to brighten the darkest of Winter days. Litter Pick and Weed Clears are continuing each month (unfortunately a necessity due to the proliferation of fast food takeaway outlets and litter louts). Three brothers from Turn Village lost their lives within months of each other during the Great War. These heroes, along with others will be honoured on Remembrance Day by the laying of wreaths at the memorial stone. We now have our own Christmas lights, installed on a cherry tree by the bus shelter (this area is becoming the focal point of the village). Friday 30th November, the Christmas lights will be “officially” switched on, with a community gathering around the tree. We’ll be having a lucky dip for the children, with prizes including Advent calendars and other festive treats. Unfortunately Turn Village is no longer on an active bus route, however, the village bus shelter has been refreshed internally with a coat of paint and will soon be the venue for displaying photos of local scenes and historic images. 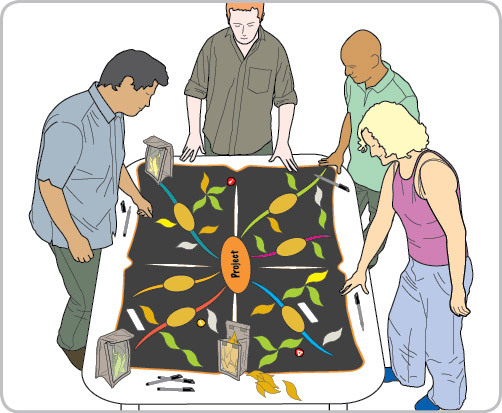 Turn Village Residents Association is working hard on installing fibre to all homes in the village by organising a Community Fibre Partnership. Hopefully we will be “up to speed” by Spring. In the last newsletter I forgot to get news from Liz for progress on the beautiful wild flower beds. Fortunately, I remembered this time! At the recent “Edenfield in Bloom” awards ceremony at the Community Centre there was a brilliant turn out with lots of winners in the various categories including the “Fingerpost Beds” ! The display there has been great over a long period and now everything is slowly winding down. 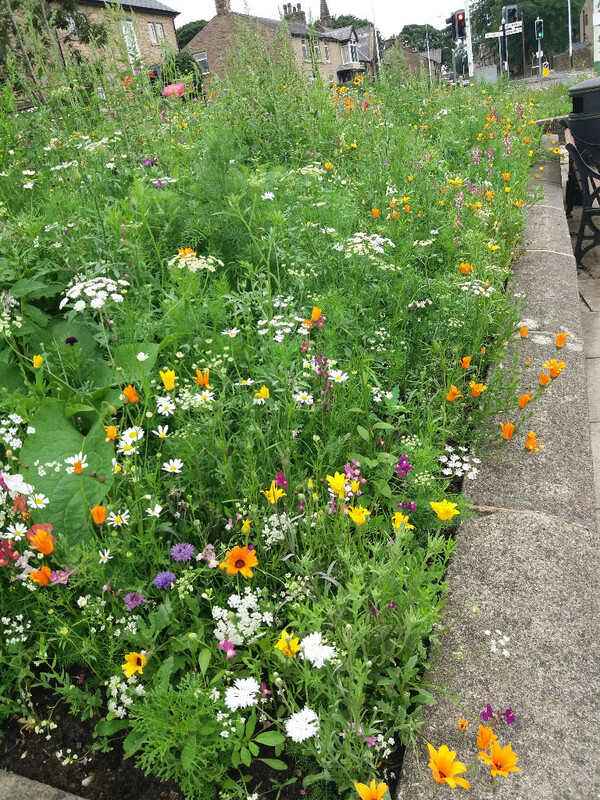 There are lots of wild flower seeds available from the flowers dying back so help yourselves folks! .A start has also been made on the end of season chop ready for a rest period over winter. Have ordered a Crab apple tree (Evereste) to plant there soon..so hopefully lots of lovely blossom in the springtime. That’s all for now…cheers everyone. …may I just admit that having lived in the valley for over 40 years I’d never visited Stubbylee Park until recently. Amazing! Clean, cared for and with fabulous views it’s well worth a visit! Congratulations to all concerned! If you would like relevant news put in the next issue please email info@civic-pride.org.uk and we’ll do our best to include it. In the meantime, a huge thanks to you all for making our valley a so much more attractive place to live. Well done you!